Delete the second sentence as irrelevant, as these cards now all have the icon. Game text on first print: "Seeds or plays on table. 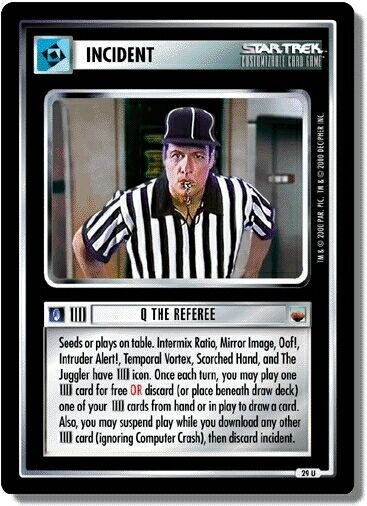 Intermix Ratio, Mirror Image, Oof!, Intruder Alert!, Temporal Vortex, Scorched Hand, and The Juggler have icon. Once each turn, you may play one card for free OR discard (or place beneath draw deck) one of your cards from hand or in play to draw a card. Also, you may suspend play while you download any other card (ignoring Computer Crash), then discard incident." When you use this incident to play a card with a Hidden Agenda icon for free, you must show the card to your opponent to verify its status before playing it face down on the table. Activating this incident does not suspend play and is not a valid response to any action. You may activate it only between other actions. The incident must already be face up before you may suspend play to download another card. See icons in game text. 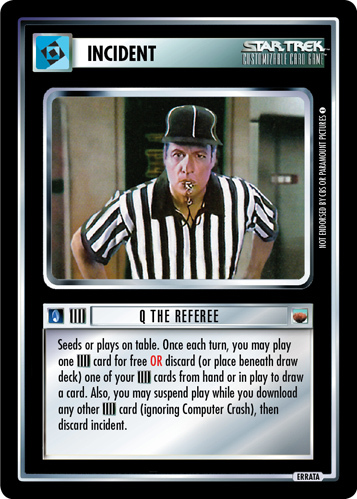 There are 14 entries for Q the Referee (ST1E 9 U 29) at the Tradeplace (30 haves and 3 wants). Click here to see all trade list entries for this Uncommon card!